It’s unlikely that your kids will grumble if you take them for a day at Alnick Castle as this vast iconic fortress is recognisable as Hogwarts from the Harry Potter films. It even has some wizard-themed activities and attractions to remind you of it – Broomstick Training, anyone? And it’s not the only time the castle has had a starring role: it’s also featured in The Hollow Crown, Downton Abbey and Robin Hood Prince of Thieves as well. There may be plenty of castles in Northumberland, but this is surely the jewel in the crown: a huge border fortress that has been the seat of Dukes of Northumberland for 700 years. As well as enjoying family-friendly wizardry, you can take a peek inside at the impressive, lavish and still-used rooms of the castle. If you can’t afford a trip to the Sistine Chapel, the castle’s state rooms with their impressive Renaissance-style painted and gilded ceilings will offer you a fair second best while the 15,000-book library and the family collection of paintings, furniture and ceramics can’t fail to impress. Standing on a hill top overlooking the River Coquet, Warkworth Castle is an impressive fortress that was another home of the Duke of Northumberland’s family and favoured by them between the 14th and 17th centuries. Together with The Hermitage, a private chapel which can only be reached by boat, it is managed by English Heritage and makes for a great day out. Warkworth is thought to date from the 12th century but much of what can be seen, including the cross-shaped keep, was built by Henry Percy, to celebrate becoming the 1st Earl of Northumberland. His son, Harry Hotspur, was perhaps its most famous resident, immortalised in Shakespeare’s Henry IV Part I. You can learn all about its fascinating history in an audio tour that’s included in the price of entry. There are also activity sheets available for kids as well as regular events and activities in the school holiday. There’s no café on site but there are vending machines and you are welcome to picnic in the grounds. 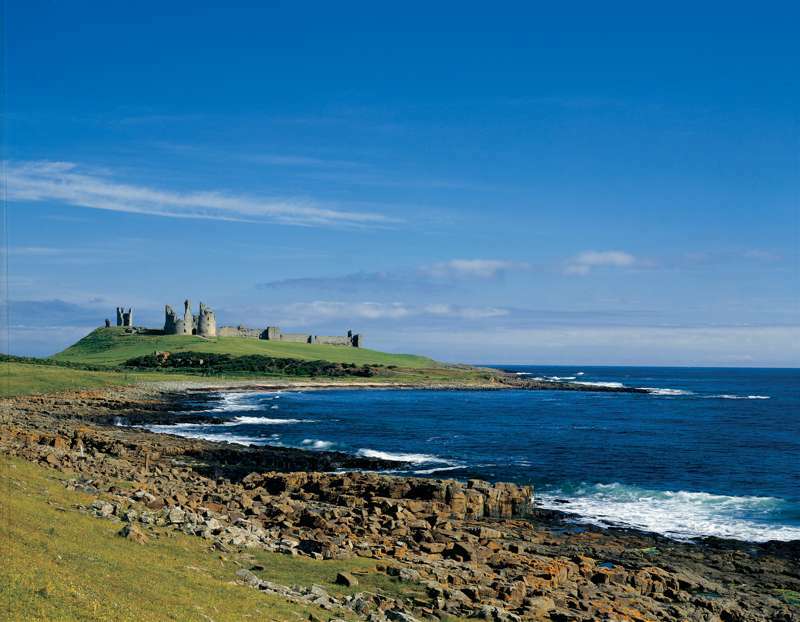 Owned by the National Trust and managed by English Heritage (so members of either get in for free), Dunstanburgh Castle was the largest and grandest fortification in northern England when it was built in the 14th century. It was the work of the Earl of Lancaster, the wealthiest nobleman in England, but he barely had a chance to see it after he rebelled against the King, Edward II, and was executed. It was used until the Middle Ages but its vast size meant it was expensive to keep in good nick and now the place is in ruins. But they are very lovely ruins that have inspired many artists over the years including JMW Turner. Perched on the coast at Dunstanburgh, it is impossible to drive up to the site and instead you have to park at Craster, about 1.3 miles away, and take a cliff-top walk to see the ruins. With stunning views of the castle and shore along the way coupled with the chance of spotting some of the area’s nesting sea birds, some might say the walk itself was reason enough to visit. When you see the views from Bamburgh Castle you realise why it makes a home fit for a king – not to mention that it’s a strategically pretty handy spot too perched, as it is, overlooking the Northumberland coast. Built on rock 150ft above the sea, it looks over the water towards the Farne Islands and Lindisfarne. There’s thought to have been a castle at Bamburgh for 1,400 years though what can be seen today is a much-restored version of the Norman structure including its impressive keep, the oldest surviving part of the castle, with its 11ft-thick walls. Once home to the Kings of Northumbria, the castle was bought by the First Lord Armstrong in 1894, who began the restoration of the castle. It remains in the family to this day and on a visit to the castle you can learn about family history as well as the history of the area and building itself. The castle has a café and shop within its nine-acre grounds. If you are making a trip to the island of Lindisfarne (or Holy Island, as it’s sometimes known), off the Northumberland coast, it’s likely that you’ll be heading to the priory to see where the Lindisfarne Gospels were written. You may also be interested in the wildlife of this island, linked only to the mainland by a tidal causeway, but how about making the time to see another of its, sometimes neglected, treasures – its 16th-century castle? It’s been in the hands of the National Trust since 1944 and underwent a full-on, 18-month restoration, started in 2016, to combat hundreds of years of being battered by the wind, sea, former residents and curious visitors. A Tudor stronghold in an exposed position, it was manned by armed guards until 1893 when it fell into disrepair before being bought and converted into a private home by Edwin Lutyens for the founder editor of Country Life magazine. Outside you can explore the small, walled garden created by Gertrude Jekyll at the same time. Take a look at the National Trust’s Lindisfarne Castle pages for the latest news on the castle. Don’t be tempted to steal any of the fascinating family heirlooms on a visit to Chillingham Castle or, legend has it, you will take a curse home with you too. A painting hangs in the Still Room of the haunting witch – just one of a number of ghosts that are said to live here alongside the Wakefields, whose family line can be traced back to the castle’s very beginnings in 13th century. Advertising itself as “Britain’s most haunted castle” with high levels of reported paranormal activity, its overnight vigils, ghost tours and visits to the dungeons and torture chamber might not be suitable for the faint-hearted. But aside from all the spooky goings on, there’s plenty to see both in and outside the medieval walls. It is largely unchanged since its medieval beginnings and the many rooms which are open to the public house a varied collection. You can refuel in the tearoom before exploring the formal 18th-century gardens and woodland walk. The ruins of Berwick Castle are best seen as part of a walk around the city’s Elizabethan ramparts. The castle was first mentioned in records in 1160 – built at the border of the Kingdoms of England and Scotland on the mouth of the River Tweed. It was completely rebuilt by Edward I with royal apartments, a great hall and a chapel. Now you’ll need to employ your imagination to get an idea of the grandeur of the castle at that time but you can also admire the views of the river, town and coast. The rampart walk is along Elizabethan walls which replaced the earlier medieval fortifications, necessary as the town was often under siege from the opposing sides. The total rampart walk is a mile and a quarter, takes about 45 minutes to complete and is free-of-charge. Another historic site on the way around, Berwick-upon-Tweed Barracks, makes for a welcome pit stop with toilets, a shop and exhibitions – for which there is a small charge to enter. And now for something completely different… a visit to Belsay Castle is the chance to see a medieval fortress, a grand Grecian hall, a Victorian tearoom and a beautiful garden too. The 13th-century castle, like so many others in Northumberland, dates to the border wars between England and Scotland with a few additions including a Jacobean mansion-house style wing. The castle was the home of the Middleton family for more than 700 years but in the 19th-century after Sir Charles Monck (formerly Middleton) had visited Athens he decided to build a new home in a Grecian style within the grounds. On a visit to this English Heritage site you can see the castle, colonnaded hall and the beautiful gardens in between – including the Quarry Garden where an impressive display of rhododendrons and ferns flourish in the place where the stone for the Grecian hall was taken from. There’s a Victorian Tearoom on site too so you won’t go hungry during a visit here.